Nurses have plenty of stories to tell. They’ve seen it all on their jobs, the daily drama of life-and-death, the painful loss of loved ones (parents losing a child or vice versa), miraculous recoveries after doctors have given up all hope, and even patients falling in love with them. So I felt honored being asked by the writer Kuan Guat Choo, author of Mouse Clutching Winter Melon and other books, to conduct a creative writing workshop for thirty-three nurses (and several organizers) from the Malaysian Nurses Association over a recent weekend in Kuala Lumpur. The transition from my two workshops in Kota Kinabalu (a six-hour, and a four-hour) to a two-day (16-hour) workshop in KL went smoothly thanks to the nurses/organizers assisting me all the way from Borneo. They not only posted the agenda online, but also entertained me during meals and tea breaks with their nursing “war” stories. These included swapping 'first death' encounters—the first time as a young nurse they encountered a patient who had died. One even freaked out when that very patient turned out to be still alive. Although the outside wounds suggested death (partly blown off face and loss of limbs, a soldier caught in a jungle booby trap during the communist insurgency), a more experienced nurse urged her to check his pulse—yes, he was still alive. One thing I aim for in all of my creative workshops, no matter the duration, no matter the participants, is to keep it lively and low tech to avoid technology glitches that have marred plenty of presentations (a few of my own and others at conferences when the equipment fails to cooperate or a virus wreaks havoc). So now I use a series of index cards that gives me the flexibility to adjust the tempo merely by changing some of the cards. I also make sure that everyone gets involved in the writing process by using pre-writing techniques (and making sure they’re using it properly) while taking them through a series of writing tasks and story starters to to completed first draft. Besides applying some of my Tree Methodology from Tropical Affairs: Episodes from an Expat’s Life in Malaysia, I use related examples from in Lovers and Strangers Revisited, and also share my judging tips as an editor and a judge in short story contests. To get them thinking about their own lives, I give them a range of first-person narrative possibilities, from an unusual adventure like "My Four Days with Catherine Deneuve",to something insightful like "Santa Claus Forever" or e learning lesson like when my five-year-old son Zaini paid me a surprise visit in my creative writing class in “And Please Welcome”. I taught the nurses, too, whose ages ranged from their early 20’s to 76, taking them through the steps of writing a first-person narrative about a significant, unforgettable experience on Day One. I held them back from the actual writing until I had them probe further with 5W and sensory detail questions, so when they were finally allowed to write, they were more than ready, since they’ve been thinking about it for a long time, and the results showed! No surface, off-the-top-of-their heads writing here—I wouldn’t allow it, one of the reasons I take them through the steps so they can produce some­thing not only well written (at least content wise for a first draft) but insightful, too. The nurses lived up to the challenge. More importantly, they had tangible proof of their writing to show for their efforts--something they could now work with later on and polish to make even better. On Day Two, I introduced my now grown up 19-year-old Zaini, who became an honorary nurse for the morning session, which proved to be a bonus for the younger nurses, since I was the only male present. Several of the nurses, having read snippets about him in their signed copy of Tropical Affairs, asked him to sign their books, too. I promptly used him as an example for the topic fear (for several years he had a fear of elevators after a bad experience as a toddler), and then I had the nurses explore their own childhood fears. We then moved into the realm of fiction by brainstorming topics such as “They Found Me” and “He kicked in the Door” which I developed in my creative writing classes at two Malaysian universities so my students could see the endless possibilities that the topic presented limited only by their imagination. Most of the nurses were able to turn their ideas into a story. Later, several nurses volunteered to read their narratives, even revealing personal secrets that many of their friends and fellow nurses didn’t know. Several of these, I felt, had the potential to be published—after some post-workshop writing cleanup—especially those that touched us in unexpected ways. Particularly one about an on-the-spot offer to adopt one of their patients' new born baby. Would her husband agree, on such short notice, to make that decision with her, one that will drastically affect their lives for the next couple of decades? This was a story that had been waiting to be written for over thirty-two years, and it may never have come about had this particular nurse not attended the workshop. Other stories went back even further, forty-fifty-sixty, and yes, seventy years, including a terrifying (at least for me) account of female circumcision, when two “nurses” visited their house wielding a razor blade and finding her naked hiding under her parent’s bed. Although retold in a light-hearted, lively manner that only a trained nurse could do, I was caught unaware that this went on in Malaysia for Muslim women. But that was a long, long time ago . . . Now they do the procedure in hospitals with qualified doctors shortly after the child’s birth, as they did for most of the boys back in the US during my generation. Thankfully, I have no memory of that! The things you learn at a creative writing workshop! From the comments forwarded to me, the nurses learned a lot about writing and were eager for a follow-up workshop so they can improve their writing style, even hoping to have their work edited for possible publication in their newsletter. Book ideas and an anthology were even bandied about on such topics as “first death encounters” or “first time a patient fell in love with them.” An example of the latter was being put in the awkward position of having to turn down a marriage proposal from a patient recovering from the trauma of losing his leg. With all hope gone, he hoped that the lovely nurse taking care of him would also marry him! I know for a fact that I have learned an awful lot about nurses in those two days, and I do appreciate what they have gone through in their careers as nurses. I would also like to salute the nurses of the Malaysian Nurses Association, and all nurses around the world, because we depend on them to help us and our families to get through some of the most trying, heart-wrenching periods of our lives. And yes, nurses do have plenty of stories to share, but so do many of us if we reflect back on our own lives, regardless of our professions. The truth is that too often, most of us are too busy living our lives to write, or we tend to think that no one else would be interested in our stories, our triumphs and failures. So if you’re part of any organization or an association in Malaysia (or this region), and you have a budget for personal development, as the Malaysian Nurses Association thankfully do, you might want to contact me, so I can help you deliver your story into your own eagerly waiting hands . . . .That's doctors—er, I mean, nurses—orders! *Here’s the link to the workshop in Kota Kinabalu with three attached blogs from some of the participant and a link to the second workshop in KK. 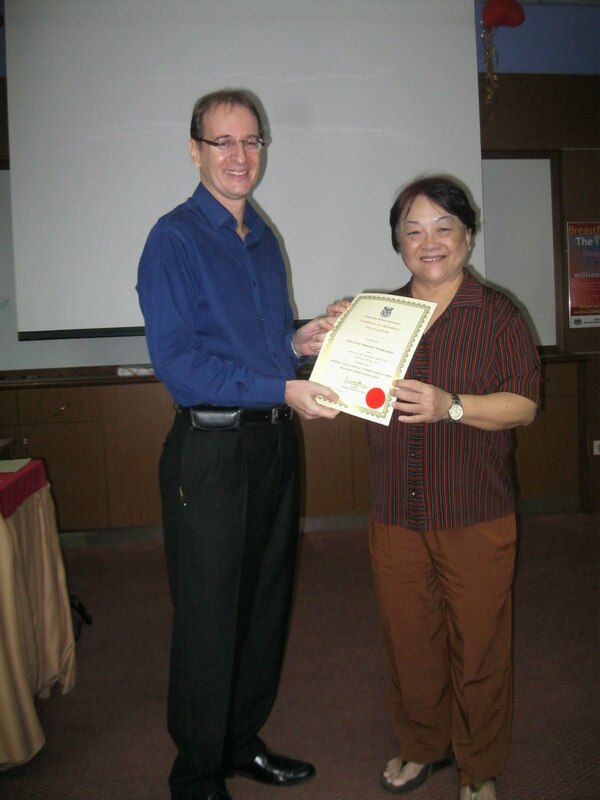 ** And another in Kuching at International Tuition School. ***If you are interested to bring one of my writing workshops to your organizations or association in Sabah/Sarawak/West Malaysia/Singapore/Brunei please contact me at robert@borneoexpatwriter.com Thank you. *Announcement latest workshops: Writing Your Life Stories Workshop—Kuching! 23 June 2012 (with links to other workshops and writing tips!) and also a workshop in KK on 17 June 2012! I love this so much! A Creative Writing Workshop for nurses? Who would have though of that, but whoever did was simply brilliant. Naturally, nurses would have plenty of stories to tell and having a workshop gives them the push and skills to do it. Gette, the credit goes to Kuan Guat Choo, author of several books, including Mouse Clutching Winter Melon. She attended one of my workshops in Penang where we met and then we both were at last years Popular Reader's Choice Award (neither of us won), and before too long it all came together and the nurses were the winners!